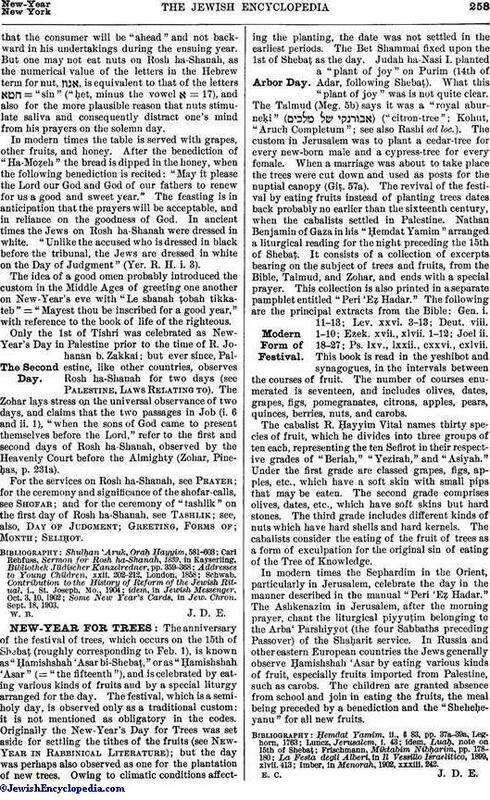 The anniversary of the festival of trees, which occurs on the 15th of Shebaṭ (roughly corresponding to Feb. 1), is known as "Ḥamishshah 'Asar bi-Shebaṭ," or as "Ḥamishshah 'Asar" (= "the fifteenth"), and is celebrated by eating various kinds of fruits and by a special liturgy arranged for the day. The festival, which is a semiholy day, is observed only as a traditional custom: it is not mentioned as obligatory in the codes. Originally the New-Year's Day for Trees was set aside for settling the tithes of the fruits (see New-Year in Rabbinical Literature); but the day was perhaps also observed as one for the plantation of new trees. Owing to climatic conditions affecting the planting, the date was not settled in the earliest periods. The Bet Shammai fixed upon the 1st of Shebaṭ as the day. Judah ha-Nasi I. planted a "plant of joy" on Purim (14th of Adar, following Shebaṭ). What this "plant of joy" was is not quite clear. The Talmud (Meg. 5b) says it was a "royal aburneḳi" ( ) ("citron-tree"; Kohut, "Aruch Completum"; see also Rashi ad loc.). The custom in Jerusalem was to plant a cedar-tree for every new-born male and a cypress-tree for every female. When a marriage was about to take place the trees were cut down and used as posts for the nuptial canopy (Giṭ. 57a). The revival of the festival by eating fruits instead of planting trees dates back probably no earlier than the sixteenth century, when the cabalists settled in Palestine. Nathan Benjamin of Gaza in his "Ḥemdat Yamim" arranged a liturgical reading for the night preceding the 15th of Shebaṭ. It consists of a collection of excerpts bearing on the subject of trees and fruits, from the Bible, Talmud, and Zohar, and ends with a special prayer. This collection is also printed in a separate pamphlet entitled "Peri 'Eẓ Hadar." The following are the principal extracts from the Bible: Gen. i. 11-13; Lev. xxvi. 3-13; Deut. viii. 1-10; Ezek. xvii., xlvii. 1-12; Joel ii. 18-27; Ps. lxv., lxxii., cxxvi., cxlvii. This book is read in the yeshibot and synagogues, in the intervals between the courses of fruit. The number of courses enumerated is seventeen, and includes olives, dates, grapes, figs, pomegranates, citrons, apples, pears, quinces, berries, nuts, and carobs. The cabalist R. Ḥayyim Vital names thirty species of fruit, which he divides into three groups of ten each, representing the ten Sefirot in their respective grades of "Beriah," "Yezirah," and "Asiyah." Under the first grade are classed grapes, figs, apples, etc., which have a soft skin with small pips that may be eaten. The second grade comprises olives, dates, etc., which have soft skins but hard stones. The third grade includes different kinds of nuts which have hard shells and hard kernels. The cabalists consider the eating of the fruit of trees as a form of exculpation for the original sin of eating of the Tree of Knowledge. In modern times the Sephardim in the Orient, particularly in Jerusalem, celebrate the day in the manner described in the manual "Peri 'Eẓ, Hadar." The Ashkenazim in Jerusalem, after the morning prayer, chant the liturgical piyyuṭim belonging to the Arba' Parshiyyot (the four Sabbaths preceding Passover) of the Shaḥarit service. In Russia and other eastern European countries the Jews generally observe Ḥamishshah 'Asar by eating various kinds of fruit, especially fruits imported from Palestine, such as carobs. The children are granted absence from school and join in eating the fruits, the meal being preceded by a benediction and the "Sheheḥeyanu" for all new fruits. Imber, in Menorah, 1902, xxxiii. 242. Classified List of Places of Jewish Interest in New York. 4. Young Men's Benevolent Association. 13. Young Men's Hebrew Association. 17. Hebrew Benevolent and Orphan Asylum. 19. Hebrew Sheltering Guardian Society. 4. Hebrew Sheltering House and Home for Aged. 14. Home for Aged and Infirm Hebrews. 11. Baron de Hirsh Trade-School. 4. B'nai Brith (downtown branch). 10. Clara de Hirsh Home for Working Girls. 5. Educational Alliance, Branch A. 6. Hebrew Technical Institute for Boys. 4. Hebrew Technical School for Girls. 3. Jeshibath Rabbi Isaac Elchanan. 16. Jewish Theological Seminary of America. 10. Ahawath Chesed Shaar Hashomaijim. 1. Mill Street Synagogue, Site of. 1. Shearith Israel (Mill Street Site). 4. Shearith Israel (Crosby Street Site). 7. Shearith Israel (19th Street Site). 16. Temple Israel of Harlem.